coastal cleanup | NUS Toddycats! It’s Earth Day on Sunday 22nd April 2018, with a focus on the battle against plastic pollution. Join the International Coastal Cleanup Singapore volunteers on a mangrove cleanup on Sunday, 22 April 2018: 7.30am to 12.00pm at Lim Chu Kang East [see site details here]. There is transport from Kranji MRT. For registration and details, please see the Eventbrite registration page. Please register by Thu 19 Apr 2018. Sat 01 April 2017: 7.30am – Join us for a very muddy World Water Day mangrove cleanup @ Lim Chu Kang! Join NUS Toddycats for the third year-round coastal cleanup at Lim Chu Kang. We are determined to clear this area of marine debris and plan to get muddy as we venture deeper into the mangrove this time. Working alongside us on the beach will be volunteers from NUS SAVE. Transport is provided for 40 people (be sure to choose the right ticket), read all the details (itinerary, safety, site details) at the Eventbirite registration page. Sat 04 Feb 2017 – 67 volunteers from Toddycats & Friends removed 888kg of trash in more than 100 trash bags from Lim Chu kang beach and mangrove for the Chinese New Year / World Wetlands Day coastal cleanup. 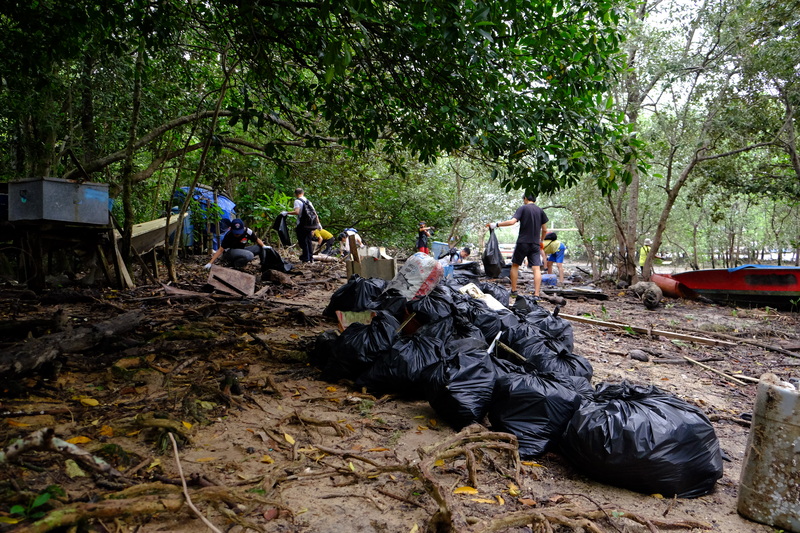 See “Almost 900kg of rubbish cleared from Lim Chu Kang mangrove,” by Zhaki Abdullah. The Straits Times, 05 Feb 2017 which featured regular volunteer Adrian Lim and his four-year old daughter Elizabeth (see photo below), and the video uploaded earlier the same day here. Happy National Day from mangrove cleanup volunteers! Read about the 2016 Pre National Day Mangrove Cleanup at the ICCS blog. 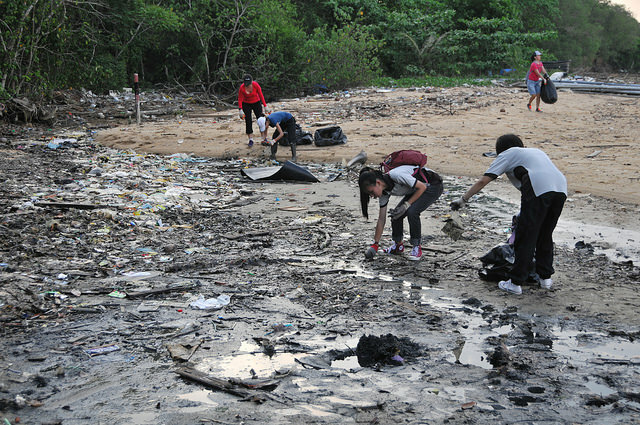 Every year, volunteers with the International Coastal Cleanup Singapore (ICCS) celebrate National Day with a coastal cleanup @ Lim Chu Kang beach and mangrove. This year we will be working on Saturday 6th Aug 2016: 8.00am – 10.30am. To join us, Sign up here by 1st August 2016! For more details, see the ICCS blog. As in previous years, we’ve come together and contributed to a couple of events for the Pesta Ubin 2016 calendar! The Ubin Pavillion. Photo by Marcus Ng. Our journey begins! Photo by Marcus Ng. The bumpy road to the Ubin pavilion. Photo by Marcus Ng. 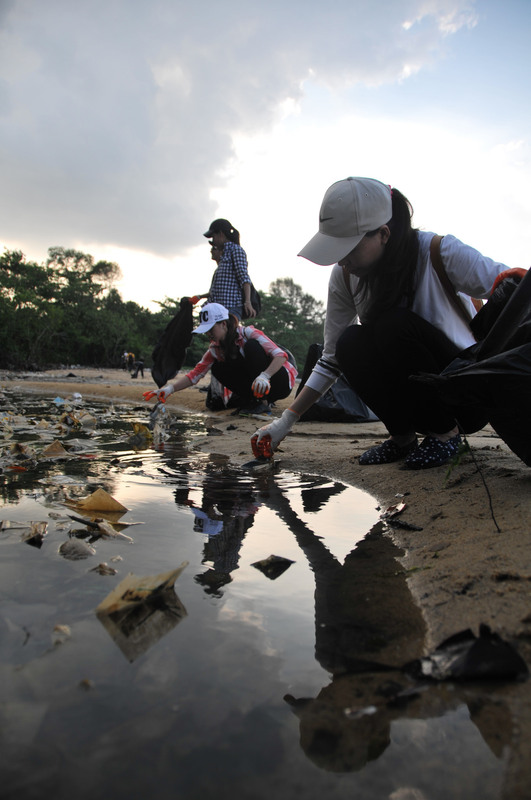 This year Ubin Day has morphed from one weekend of short-lived fun into a month-long festival from 14 May to 12 June (Pesta means Festival in Malay). It was designed to celebrate Ubin’s kampong lifestyle, the Ubin Way, and its value as a nature refuge and to offer the public a glimpse of our past heritage. Despite the rain, the booths from various local NGOs received a strong showing from the public. About 3000 visitors came to soak in the festive mood by participating in the myriad of events and informative booths. The celebratory atmosphere was buoyed by kampong games such as capteh and hopscotch. Activities such as cycling, kayaking and coastal clean-ups were made available too. Raising awareness for our rarer otter species, the Asian small clawed otter. Photo by Emmanuel Goh. ToddyCats young and old unite! Photo by Joelle Lai. Highlighting the plight of our black tipped reef shark specimen. A casualty of illegal drift nets. Photo by Marcus Ng. A bird’s eye view of our booth and photos of Jubilee’s stomach contents. Photo by Marcus Ng. It was a delight to educate and raise awareness of the importance of conserving our local marine biodiversity in Singapore. Ten specimens on loan from the Lee Kong Chian Natural History Museum were chosen to highlight some examples of marine life found on our shores and the disastrous after-effects of littering, boat crashes, illegal fishing and the importance of conserving our local biodiversity. Showcasing our hawksbill turtle. Photo by Erin Tan. Families were awed by our rich local marine biodiversity. Photo by Joelle Lai. Our baby dugong specimen, a casualty of boat collisions. Photo by Marcus Ng. Crabs galore! Photo by Marcus Ng. Our specimens from LKCNHM included a baby dugong, a dog-faced water snake, a giant mudskipper, an Asian small-clawed otter, shells from various local marine clams and snails, a black-tipped reef shark, a tree-climbing crab, a hawksbill turtle and seahorses. Pictures of our sperm whale, Jubilee, were also on display to highlight the imminent threat that plastics can have on sea creatures, even on large ones like whales. Our local marine biodiversity too is not immune to this global crisis of plastic waste. There are four ways in which marine life is impacted by plastic littering: strangulation of animals from entanglement, ingestion of plastics when animals mistake it for food, bioaccumulation when young fish or crustaceans eat micro-plastics (microbeads found in face-wash products) and the leakage of toxic pollutants into the ocean as plastics slowly degrade. Minister for National Development, Mr Lawrence Wong, and Senior Minister of State, Mr Desmond Lee, graced the event as our guests of honour. Mr Wong announced that by mid 2017, the National Parks Board (NParks) would take on the role of central management agency and be in sole charge of managing Ubin. Cherry showcasing our hawksbill sea turtle to Minister Lawrence Wong. Photo by Chia Han Shen. Group photo with our guests of honour. Photo by Marcus Ng. In his speech, Mr Wong also highlighted several books launched in celebration of Ubin such as “Footprints on an Island: Rediscovering Pulau Ubin” by Chua Ee Kiam, Choo Mui Eng and Wong Tuan Wah and “Hunt for the Green Boomerang” by Neil Humphreys. Neil Humphreys promoting his new book, The Hunt for the Green Boomerang. Photo by Marcus Ng. Hopscotch fun organised by the Singapore Kindness Movement. Photo by Chia Han Shen. Apart from the humans, other living creatures such as the oriental-pied hornbills and green imperial pigeons were also in attendance during the event. Their presence further illustrates that Ubin continues to be a birdwatcher’s paradise and an important refuge for threatened species. Even Ubin’s friendly resident stray dogs came to pay a visit and provided great company. Ubin’s friendly stray dogs joining in the festivities. Photo by Joelle Lai. Green Imperial Pigeon. Photo by Marcus Ng. Oriental-pied hornbill in flight. Photo by Marcus Ng. The children had their fair share of activities to take part in and be excited about as well! We organised a badge-making session which kept the children thoroughly entertained in creating their very own badges, giving them a colourful experience and a sense of pride in putting their creativity to good use. Toby the Otter says Life in Plastic, Not so Fantastic! Photo by Emmanuel Goh. Colouring badges is fun! Photo by Erin Tan. Letting kids have a go at the badge machine! Photo by Erin Tan. Assembling the badges before they are pressed. Photo by Marcus Ng. We got a production line going! Photo by Emmanuel Goh. To conclude, Pesta Ubin was a celebration of all things nature and our kampong roots. If our heritage in Pulau Ubin is lost, we would not only lose our window into the past, but something more significant – our identity with nature. Our local biodiversity may be resilient but if we are not mindful to reduce our carbon footprint and protect our environment, we may stand to lose much of our precious Earth. For more pictures, view our Flickr album! Morning group photo after setting up! Photo by Marcus Ng. This year’s Pesta Ubin badge! Last two standing! Photo by Joelle Lai. Year Round Coastal Cleanups by the ICCS Otters! Every year, the ICCS Otters coordinate the annual International Coastal Cleanup Singapore, held on the 3rd Saturday of every September. This event brings together some 3,500 individuals every year from all around our island, all with a desire to do rid our beaches and mangroves of marine trash! Besides the annual cleanup, we also organise Year-Round Coastal Cleanups (YRCCs) at various coastal locations around the island to relieve many of these habitats of trash. Many of these non-recreational beaches and mangroves hold a vast amount of biodiversity despite their heavy trash load, and coastal cleanups play a role in protecting marine life from hazardous trash. 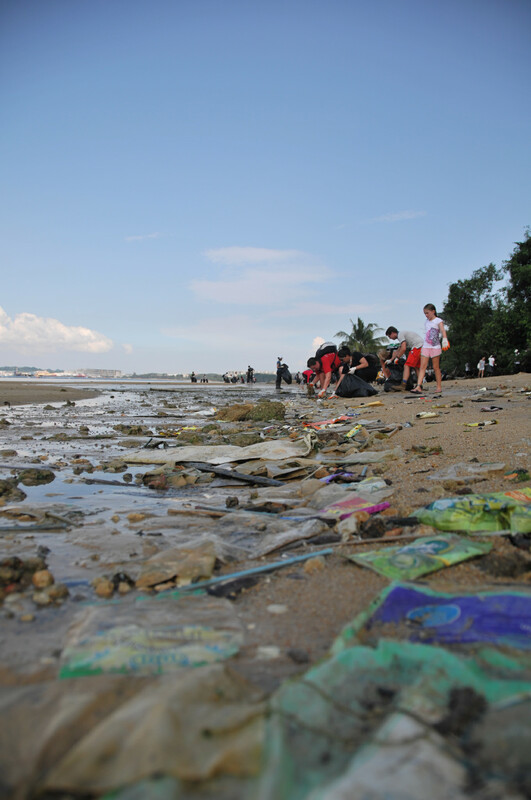 These cleanups also provide an insight to participants about the extent of trash deposited in our ecosystems, a such scenes are often shielded from the eyes of everyday Singaporeans. We’ve still got a full calendar ahead of us in the next few months, and if you’d like to join our efforts in the fight against marine trash, mark these dates down! Do look out for an announcement with detailed information on the event and a sign up sheet that we release two weeks before every cleanup. Join a group of passionate individuals determined to make a difference in the environment! To keep updated of all our events, do follow us on Facebook (fb.com/iccsg) and our blog, or join our mailing list! Taken during the World Biodiversity Day Coastal Cleanup – 18 May 2015.